Upper Hellesdon post mill buck was set on a large 3 storey roundhouse and used patent sails turned to wind by a fantail to power 2 pairs of French burr stones and a flour mill. A baking office and shop were operated on the premises. 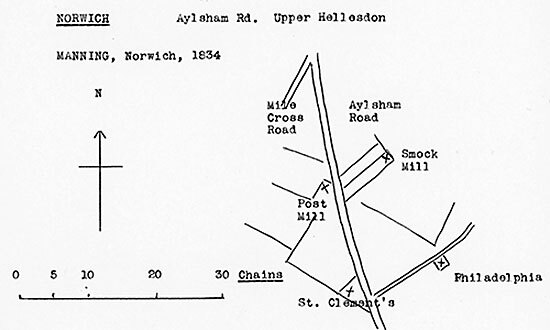 The shop faced the Aylsham Road with the mill standing further back. Freehold Messuage near Batson's Mill in Hellesdon . . .
A tramp called on Edward Batson on the 3rd January 1823, causing some distress to the family. He was removed to the Bridewell but died that night. Saturday last an inquisition was taken at the Bridewell in this city, before Wm. Bell, Gent. Coroner, on view of the body of Robt. Blogg, aged 65, a vagrant, belonging to Erpingham, in this county. It was proved in evidence that the deceased called at the house of Mr. Batson, in the hamlet of Hellesdon, on Friday evening last, about six o'clock: where his conduct and appearance were such as to cause the family so much unpleasantness, that Mr. Batson had him apprehended, and he was taken to the Bridewell, where he was put to bed, and next morning was found to be no more. No marks of violence appearing on the body, the Jury returned a verdict of - Died by the visitation of God. A Substantial well built POST WINDMILL (with or without a Dwelling house and Baking office) in good repair and in excellent condition, works two pair of French burr stones and going gears complete etc., has a superior brick built Roundhouse with three floors, the whole capable of doing extensive business. Also to be Sold or Let. Between 60/70 acres of Pasture and Arable Land . . . Apply to Mr. Wm. Hewett, Upper Hellesdon near Norwich, Mr. T. D. Hawkins, Whissonsett or Mr. Henry Stokes, Solr. Fakenham. The mill was marked on the 1824 map. Edward Batson was bankrupt and petitioning for relief in 1833. A Steady Active YOUTH of respectable connections, who will be treated as one of the family. At the Court House, at Norwich Castle, in the county of Norfolk, on the 16th day of November next, at Ten o'clock in the Morning precisely. EDWARD BATSON, late of the hamlet of Hellesdon, in the county of the city of Norwich, Miller and Shopkeeper. The mill was marked on the 1834 and 1838 maps. 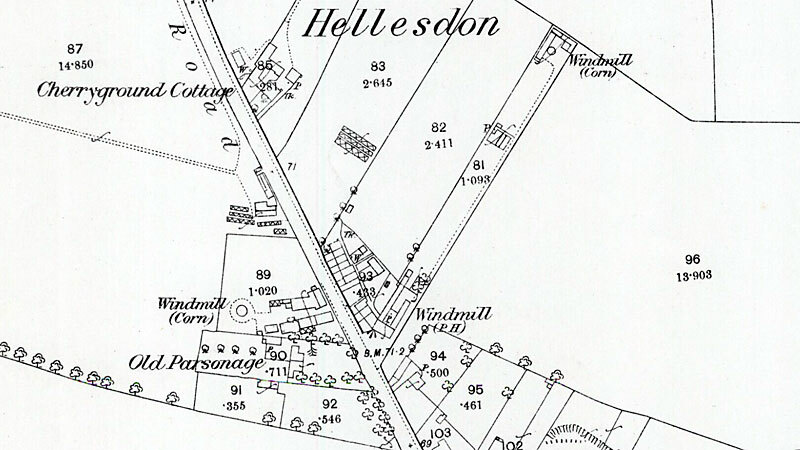 Edward Batson was listed in Billy’s Directory of 1842 as being in St. Faith’s Lane, Upper Hellesdon. He was in Court in 1844 for the non-payment of rates. POOR RATES. Edward Batson, of Hellesdon, was summoned for £1. 13s. 9d. – Mr. J. H. TILLETT appeared for the defendant, and after a good deal of argument with Mr. KERRISON respecting the legality of the rate, the case was adjourned till Wednesday following. Edward Batson discovered a theft from a granary he occupied in 1848. Wheat Stealing. – A curious case of wheat stealing, in which the party robbed had been applied to, to buy his own wheat, was heard before the city Magistrates, on Thursday. Robt. Sidney and Wm. Frost, both of Cossey, were charged with having been concerned in the robbery, under the following circumstances: - Mr. Batson has a granary in King-street, from which a quantity of wheat was supposed to have been stolen on Monday last. Frost, it appeared, took a coomb of wheat to the Bee Hive public house, in St. Benedict’s on the following day. The landlord gave a sample of it to a person named Walker, who on Wednesday offered the wheat for sale to Mr. Batson, asking 23s. per coomb for it, and showing the sample, Mr. Batson thought he knew his own wheat again, as it was a peculiar sort, and after making enquiries about it, he directed the landlord of the Bee Hive to detain the wheat. Information was given to the police, and Frost was asked how the wheat came into his possession. He first stated, that it had come from Sidney, and when he was asked about it he said, that one day, a stranger, in King-street, had put it on his cart for pig’s victuals, and, on the following morning, he found it was wheat. Mr. Batson produced a sample of the wheat, from the bulk, which, compared with that offered for sale, appeared to be the very same. Both the prisoners were remanded. The two men named Robert Sidney and William Frost, of Costessey, who had been remanded, were again brought up on a charge of having stolen a coomb of wheat. – Mr. Staff appeared for the prosecution, and Mr. Bates, of Whissonsett, as the prosecutor. – Mr. Atkinson appeared for the defence. This was a rather interesting case of circumstantial evidence. – Mr. Rackham, who keeps the Bee Hive public-house, said, that he knew Frost, who came to his house on the previous Tuesday, and left a quantity of wheat in a sack, which, he said, he would leave for sale at 23s per coomb. Witness spoke to a Mr. Walker, who was in the habit of selling wheat, about it; and he took a sample of it. Afterwards, Mr. Batson, a miller, came and looked at the wheat, and he requested that it should not be taken away. Inspector Steward took a sample of it, sealed-up the sack, and took it away. – Mr. Thomas Walker, of St. Swithin’s, stated, that he took a sample, and knowing Mr. Batson, offered it to him for sale at 23s. per coomb. Mr. Batson, who had a granary in St. Ann’s Staithe Lane, King-street, said, the last witness had shown him the ample, and in consequence he went to look at the bulk, when he suspected something was wrong, believing that it had been stolen from his granary of from his mill, or from Mr. Culley, of Costessey. He was sure none such was grown at Costessey, or in Norfolk. He knew that he had some exactly like it. Inspector Steward said, in consequence of what he had been told, he went to Costessey, on Thursday morning, accompanied by Inspector Barrett, of the county police. – They found Frost at home, and asked him how he came by the coomb of wheat? He did not give any answer for some timer. His wife said, there had been no wheat in the house. At length the prisoner said, that he took the sack up for his neighbour Sidney. Inspector Barrett then went into Sidney’s house, and returned to Frost’s with him. Sidney then said, in Frost’s presence, that he was down a lane in King-street, near Thompson’s brewery, and a man named George Orford, put a sack on his cart to be carried, saying it was pig’s victuals. He took it home; and on the next morning he found it to be wheat. – Witness had been to the granary on the previous Thursday, and he found there were 29 coombs of wheat, of which he took the sample now produced. Inspector Barrett said, he asked Sidney to account for the wheat, which Frost said he (Sidney) had given to him to carry to Norwich? Sidney answered, that he had not sent any wheat to Norwich, but when taken into Frost’s house, he said, that he had been to Norwich on the previous Thursday, and that George Orford had put the sack on his cart, as pig’s victuals. On the following morning he found it was wheat, and he asked Frost to take it to Norwich. When reminded, that at first he had told a different story, he said he did not mean it. Mr. Robert Bates, of Whissonsett, said, that he was a merchant and dealer in corn. He was joint occupier, with Mr. Batson, of a granary in St. Ann’s Staithe Lane, and he had a quantity of wheat lying there, of a peculiar description. He examined three samples of wheat produced, one from the granary, with two others; and he declared that they were all alike. He identified the sack as his property. He had (or ought to have) 25 sacks of that wheat in the granary. Thomas Jacobs, a corn measurer, who had been in the habit of measuring corn in Mr. Bates’s granary, deposed, that there were only 29 coombs and one bushel then in the granary. He had seen the sack in the station, which contained three bushels and about a peck, which, added to the 29 coombs one bushel, would make about 30 coombs. He knew there was such a man as George Orford, but had not seen him for about ten months. The prisoners, when asked what they had to say in defence told a similar tale to what they had told the constables. – They were committed for trial. Christmas Robert Sidney, (40), and Wm. Frost, (45), were indicted, for having stolen one sack and one coomb of wheat, the property of Robert Bates, of Whissonsett. – Mr. W. Cooper and Mr. Drury prosecuted; and Mr. Evans defended Sidney; and Mr. Carlos Cooper defended Frost. Mr. Robert Bates had a granary in St. Anne’s Lane, King-street, where, before January 14th, he had 30 coombs of wheat, and in consequence, he had his wheat in the granary measured. He compared the wheat shown him by Steward to what was in his granary, and he believed the to be the same wheat. Steward had shown him a sack which he believed to be his property. – Thomas Jacobs, of St. Julian’s, a porter, had measured the wheat in the granary after the prisoners were apprehended. He found 29 coombs and one bushel. He measured some out of a sack shown him by Steward – three bushels and one peck; the wheat in the sack and the wheat in the granary correspond exactly. It appeared, from other witnesses, that Frost had left a sack of wheat (to be sold for 23s.) at Mr. Rackhams, innkeeper, St. Benedict’s, where he usually put up; and on Inspector Steward’s inquiring about it, it was shown him. He took a sample, and sealed up the sack; and went, the next day, and apprehended Frost, -- who said, after some hesitation, that he had the wheat from Sidney. Inspector Barrett, who was with Steward, then went and apprehended the other prisoner, and with him to Frost’s, Steward asked Sidney if he could account for the sack of wheat? He replied, that he went for coals down a lane opposite Thompson’s brew-office, in King-street, and the wheat was put on his cart; he thought it was pig’s victuals. Inspector Barrett observed to him “That is quite a different tale to what you told me; you said you had sent no wheat to Norwich.” Sidney said “If I said so I did not mean it.” He said George Orford put the sack on his cart; he took the sack home, and on the next morning when he unloaded his cart he found it was wheat. Mr. EVANS put to the Court, that, if Sidney’s statement was taken at all, the whole of it must be taken, and that he had got the wheat from Orford, who had run away. The RECORDER said, it was quite clear, that one of the prisoners must have been a receiver, and therefore entitled to an acquittal as a principal. The question was, whether they were not both receivers. Orford did not appear to be a fictitious character, and he did not consider that there was a case against the prisoners to go before a jury as principals. The mill was put up for auction in April 1849, after the owner Robert Wakeling, died. Under the Will of ROBERT WAKELING, deceased. A Capital WINDMILL, with Round-house, substantial brick and tiled Dwelling-house, Outbuildings, and Land, as occupied by Mr. Edward Batson. For leave to view apply to the Tenant. Mr. C. Drake, Solicitor, or the Auctioneer, both of Bungay, and of whom printed particulars and conditions of Sale may be had one week before the Auction. Edward Batson was listed in Hunt and Co.’s Directory of 1850 as a miller at Upper Hellesdon. The mill was again for auction in January 1850. TWO-THIRDS of the Purchase Money may remain on Security at 4½ per cent. Particulars and Conditions of Sale may be had of the Auctioneer, Beccles; or Mr. W. Kerridge, Bungay, in due time. The mill was advertised again on the day of the sale as being late in the occupation of Edward Batson. Despite this, Edward Batson continued at the mill for some years. In 1851 he was given as a master miller and merchant aged 58 living in Aylsham Road, Hellesdon with his wife C. C., 55. He was listed in White’s Directory of 1854 as a miller in Magdalen Street and in Melville’s Directory of 1856 as a corn and seed merchant; and corn miller at Hellesdon. He was involved in a Court case in 1859, when he alleged that he had not been paid for some meat he had sold. Powerful Windmill, Dwelling House, Grocer's Shop, Butcher's Shop, Stable and Outbuildings, Fronting a Turnpike Road, and One Acre of Land at HELLESDON within half a mile of Norwich. To be Sold by Auction without Reserve at the Royal Hotel, Norwich This Day (Saturday) January 19, 1850 at 3 for 4 o'c. by Mr. Robert Butcher. Immediate possession may be had. Two-thirds of the Purchase Money may remain on Security at 4½%. Particulars of the Auctioneer, Beccles or of Mr. W. Kerridge, Bungay. A PIG’S LEG. – The plaintiff in the case of Mr. Edward Batson v. James Boardman, is a miller, and the defendant an extensive grain merchant in Norwich. The suit was instituted to recover 8s. 7d., being the price of a leg of pork sold to the defendant so far back as the 16th of March, 1855. Mr. Boardman admitted both ordering and receiving the pork, but stated that he paid for it on delivery. He got a receipt for it at the time, which was put into his cashbox, but which had afterwards been stolen. He produced, however, a memorandum that he had made of the payment when the pork was delivered, which sufficiently satisfied the Judge, who non-suited the plaintiff. Edward Batson was again before the Courts in 1863, this time he was charged with breach of the peace. GUILDHALL – MONDAY, OCTOBER 26. Before J. G. JOHNSON, R. W. BLAKE, H. WOODCOCK, F. BROWN and H. WILLETT, Esqs. BREACH OF THE PEACE. – Edward Batson, of Magdalen-street, was charged by W. H. Wells, of St. George’s, with committing a breach of the peace. Mr. A. Tillett appeared for the defendant. – Complainant said he was standing near the Post-office on Friday last, when the defendant came down the street from the Market-place. He was muttering something about having sold flour over his head, and said he would horse-whip him and take the consequences. Complainant then crossed over to the other side of the street. Defendant repeated the assertion two or three times. – In cross-examination complainant denied having heard him say “If you sell flour over my head,” and further denied having attempted to sell flour at a lower price, as alleged by the defendant. – Defendant promised, without adding any conditions, not to molest complainant, and was bound over in his own recognizances, to keep the peace for three months. MESSRS. SPELMAN nave received instruction from the Mortgagee, to SELL by AUCTION, on Wednesday, September the 5th, 1866, at Six for Seven o'clock in the Evening, at the Norfolk Hotel, Norwich, in One Lot, A WINDMILL (winds herself), with Brick Roundhouse, two Patent Sails, drive two pairs of French Stones, Flour Mill, &c.
A DWELLING HOUSE and SHOP adjoining, now occupied as the Post-office, two Cottages, Stables, Cart-shed, Pump, Garden and Land, containing altogether about an Acre. – Freehold. The Mill and House are occupied by Mr. Batson, and possession may be had at Michaelmas next. Particulars and Conditions of Sale may be had of Messrs. Jay and Pilgrim, Solicitors, Norwich; and of Messrs. Spelman. Also at the above time and place will be Sold One Pipe of PORT WINE. Two Quarter Casks of BRANDY. The above are in Bond, and will be Sold by sample. Edward Batson was listed in White’s Directory of 1868 as a corn merchant in Magdalen Street. He was also listed as a corn miller and postmaster in Hellesdon. He died in March 1871. BATSON. – On the 19th inst., Mr. Edward Batson, many years a resident of Hellesdon, Norwich, in the 79th year of his age. Potter Batson was the miller from 1868 to 1872. He was born c.1825 in Hellesdon and in 1861 was given as living in Aylsham Road with his parents. It appears that Potter Batson left the mill at Michaelmas 1872, and went to work for W. H. Wells at the New Mills, in Norwich. His career there ended abruptly! Before the MAYOR, (R. Chamberlin, Esq. ), W. J. UTTEN BROWNE, F. E. WATSON, E. K. HARVEY, and J. M. VENNING, Esqs., and Dr. BATEMAN. Before R. CHAMBERLIN (MAYOR), E. K. HARVEY, W. J. UTTEN BROWNE AND J. M. VENNING, Esqs. Potter Batson, miller, Albert-street, Heigham, was brought up on remand on the charge of stealing a quantity of flour, the property of his employers, Messrs. Wells of the New Mills. – Mr. Brown (from the office of Messrs. Emerson and Sparrow) appeared for the prosecution; and Mr. Linay defended. – Detective Wigley having given evidence as to himself and Detective Mason apprehending the prisoner in the act of taking away the flour, Mr. Julian Wells was called and deposed to the prisoner not having any right to take the property away. – Prisoner now pleaded guilty, and Mr. Wells having recommended him to mercy at the solicitation of Mr. Linay, he was sentenced to only two months’ hard labour. WANTED, a Baker, one who can occasionally Assist in the Mill. Wanted, a Man who is capable of taking charge of a Windmill. Philip Rose, Upper Hellesdon, Norwich. Philip Rose was the next miller. He was born c.1825 in St. Mary’s, Norwich and was a master baker before becoming a miller. He built a Steam mill that burnt down in February 1876. Fires in Norwich. – Shortly before six o'clock on Thursday morning, a fire was discovered at the steam flour-mill of Mr. Philip Rose, Upper Hellesdon. It originated in a carpenter’s shop and engine-house, and spread to the adjoining mill, which together with the stores of flour, pollard, &c., the machinery and plant, was totally destroyed, only the walls and chimney being left standing; but the dwelling-house, which was near by, was fortunately preserved. The mill is insured in the Norwich Union office. The Late Fire at Upper Hellesdon. DESIRES to return thanks to Mr. Robert Hitchman, Supt. Barnard, and the Fire Brigade generally, for the timely assistance rendered by them at the late Fire on the 17th inst., and begs to assure his Customers and Friends that his Business (having another Mill at his command) will be carried on as usual. Before W. J. UTTEN BROWNE, Esq., and the DEPUTY MAYOR, (E. K. HARVEY, Esq.). John Balding, market gardener, Upper Hellesdon, was summoned by Philip Rose, miller, Hellesdon, for using obscene language in the public street there, and the case was dismissed on the complainant saying he was not sure which obscene words were used by the defendant. Philip Rose found himself in Court in August 1878, following a late night drink in a pub. Before E. K. HARVEY, GODFREY BARNDARD, and SIMMS REEVE, Esqs. Philip Rose, miller, Hellesdon, and Fras. Walker, labourer, Pye’s-yard, St. Martin’s-at-Palace, were summoned for being in the Light Horseman public-house at 11·30 pm, and on pleading guilty, were fined 1s. with costs 6s., or three days imprisonment each. - The money was paid in each case, but Mr. Rose expressed his opinion that it was a very dear grog meeting. The Bench observed that the fine and costs were very light. Philip Rose was listed in Hamilton’s Directory of 1879 as a miller & baker in Upper Hellesdon Road. Drink was again the cause of Philip Rose appearing in Court, this time in November 1879. Before W. J. UTTEN BROWNE, Esq., the DEPUTY-MAYOR (J. D. Smith, Esq. ), Major MICKLETHWAIT, Dr. BATEMAN, J. BETTS, E. FIELD, R. FITCH, and E. K. HARVEY, Esqs. Philip Rose, baker, Aylsham-road, was charged on a warrant with assaulting his wife. – Mr. J. G. Atkinson appeared on behalf of the complainant, and having opened the case said if the Bench thought the assault was sufficiently proved he should ask for an order, under the Matrimonial Causes Act, to have the defendant live apart from his wife and to contribute to her support. Mr. Carlos Cooper appeared for the defendant. Complainant stated that when her husband came home on Saturday afternoon, he asked her if she had fed the pigs. She answered in the affirmative, and he told her it was a lie. He then asked if she had eaten any pears, and she answered that she had eaten some, and would continue to do so while they were in the house. Defendant said that she should not “eat them from his people,” and then struck her on the chest with his fist, and followed that blow up with two more on the nose and eye. She fell down in consequence of the blow on the chest. From what she could remember he struck her in the eye while she was on the ground. When she got up she found that there was much blood on the floor (the complainant here wept bitterly). The marks which were upon her face were made by defendant’s fist. About half an hour after the assault, a customer of her husband’s named Banham came into the shop. Defendant told her that his wife could not see her as she had “a broken snout.” Complainant went into the shop, and asked Mrs. Banham if she did not look a beauty, and that lady replied that she did not look a beauty, and asked her how she came by the blows. Defendant then said that she had not, and that she had fallen against a chair and hurt herself. Complainant said that she had not, and that defendant had struck her, and Mrs. Banham told him that he ought to have been horse whipped. In cross-examination complainant said defendant was the worse for drink at the time, or he would not have struck her. She did not know that he was saving the pears in question for his grandchildren. When she told him that she should eat the pears, perhaps she did not say so in a mild tone, and perhaps it would have been wiser had she left the room altogether. She fell on her back, not on her face. – In answer to Mr. Atkinson, complainant said she had lived with defendant ten years, and had had quarrels with him. He had struck her several times. Mary Ann Banham, of Upper Hellesdon, stated that she went to the defendant’s shop, at about six on Saturday night and enquired for Mrs. Rose. Defendant told her that unfortunately his wife had a broken snout and she could not see witness. Witness here detailed the conversation she had with complainant as given above. She continued that the complainant’s nose was bleeding at six o'clock and this was an hour after the assault. – Cross-examined complainant’s nose was cut. Mr. BROWNE said he saw complainant’s nose had been cut. Mr. Cooper, in defence, said that he could not justify the assault that had been committed by the defendant, and he did not endeavour to do so. The defendant was a miller and a very respectable man, and on Saturday, this being a municipal election day and defendant being a very warm politician, he took a little too much to drink. Mr. Cooper did not wish the magistrates to suppose that he wished to submit that drunkenness was any excuse for crime, but he thought that in this case it went towards the mitigation of the offence, for they had been told that he was an excited man, and had been aggravated by his wife. This, he hoped, would be considered by the Bench. He then quoted a case in the Times, which came before the Lord Chief Justice at the Maidstone Assizes, in which a man was charged with the manslaughter of his wife. The evidence showed that he met his wife in the street and asked her for a shilling; she refused it, and – both being in a sober state – the prisoner knocked her down, dragged her along the street, and fractured her skull. It was then found that the woman was of an aggravating character, although on that occasion she had not aggravated the man. The Lord Chief Justice then sentenced the prisoner to only six months’ imprisonment. Mr. BROWNE said that there was no evidence here that the complainant was of an aggravating nature. Mr. Cooper submitted that she did aggravate the defendant when talking about the pears, and had admitted that he was very quarrelsome when drunk. The DEPUTY-MAYOR said that complainant did not know that defendant was drunk when he first came into the house. The magistrates then retired for consultation, and on returning into Court, after an absence of ten minutes. Mr. Cooper said that the defendant was very sorry for his conduct. Defendant – It will ruin my business. Mr. BROWNE said he should have thought of that before. He would go to the house of correction for three months. Defendant – I have a bad ankle. Mr. BROWNE said the authorities would not put him to any work at the Castle that was unsuited to him. Mr. Atkinson then applied for an order of separation under the Matrimonial Causes Act. – The complainant was then recalled, and said that she would be afraid, after the heavy sentence that had been passed upon her husband, to live with him in the future and wished to live apart. She further stated that defendant had threatened to put her in the oven. He was a miller and baker, and made up about nine or ten sacks of flour a week, and the takings in the shop amounted to £4 or £5 a week. – Mr. Atkinson asked that the defendant be ordered to pay the sum of 15s. a week towards the support of his wife. – Mr. Cooper, in reply, said that he thought this was a rather high sum. He submitted that 8s. or 10s. a week was ample for the applicant’s support. – The magistrates then acceeded to the application of Mr. Atkinson as to the separation, and made an order of 12s.a week for the wife’s support. and Bakery situate at Upper Hellesdon, viz. a steam Mill driving three pairs of stones with 16 H.P. engine and Cornish Boiler, a Post Windmill driving two pairs of French Stones, with brick round House and three floors above, four patent sails and winds herself, a bake office and loft over, Baker's Shop, Dwelling house, Vinery and Garden, Stables, Carpenter's Shop and numerous buildings adjoining. The above Lot is well adapted for the Trade of a Miller and Baker combined, being in a populous district and within a short distance of the city. Cucumber houses . . .
Baker's Shop, COTTAGES . . .
Messrs. Spelman have received instruction to Sell by Auction during August the valuable PROPERTY in the occupation to Mr. Philip Rose, the Proprietor, comprising Tower Windmill in full Trade, ranges of Cucumber Houses, Gardens etc. who died 8 December 1901.